Having finished the Highlander, I am now fired up for getting back to modelling. Mind you, it's a good thing that I had a budget set aside. Recently, I had sold some of my old railway stuff and acquired a Paypal balance of around £100. I thought that this would see me through a few models and materials. Ha! This is what I am currently working on. I started it early last year but stopped when I couldn't get the colour right. I remember seeing these race at Crystal Palace during the 1960s with John Love being one of the drivers. The problem was the shade of green to paint the bodywork. I tried every green I had but nothing seemed right. I then found a company called Zero One that make matched colours. They do a Dark British Racing Green (BRG) which looked perfect to my old eyes. I got as far as buying a bottle when my enthusiasm for modelling was overtaken by other events. So, now I am back with a vengeance. I opened up the kit box to find that there were no instructions in the box! I went off looking to see if I could find some to download. I got very sidetracked (more later) but couldn't find any. I had another root around in my stash (yes David has a stash - he always said he would never go that route!) and found the aforesaid instructions on top of one of the piles. You would think that this was good news. Well, £100 later... I ended up on Tamiya's Japanese web site (in English) but couldn't find what I wanted. What I did see was their Future Releases link (dangerous this). On that page I saw that they were re-releasing their 1973 kit of a 1:12 scale Jim Clark Lotus 49B. Jim Clark is one of my top ever drivers. The very last race that he finished in F1 was in this car. He was killed a short while later whilst competing in a Formula 2 race at Hockenheim in Germany - a great loss.This sent me off to Hannants to find out when it was coming out. They had it as a future release. End of story, or so I thought. I checked EBay to see if there were any on there and it did seem as though the kit had been released. Anyway, I forgot about it as the kit was £90 on EBay. I opened the BRG bottle yesterday so that I could paint the inside of the wheel arches. I found that the paint is of a strange mix which caused the plastic to craze a little. Now it isn't too important inside the wheel arches as they will be in heavy shade but it did matter for the body itself. 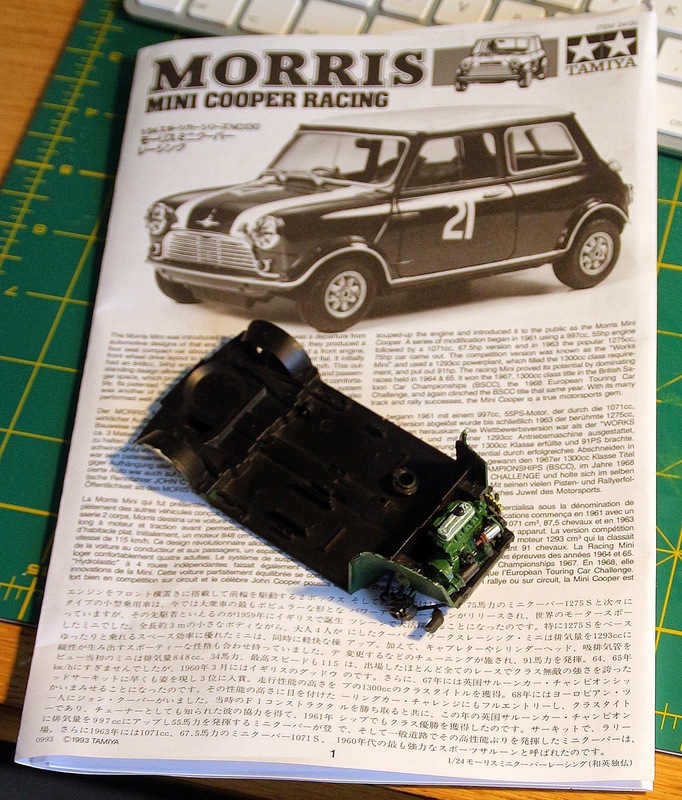 Off I went to my favourite model car web site - Hiroboy - to see about some primer. I found a bottle of Zero One primer and some airbrush cleaner. As an aside, I checked out on the Lotus kit to find that they had it at £80. A quick chat to the family accountant and everything was ordered. I have the primer, airbrush cleaner AND a Lotus 49B coming! How great is that. It is even better because Zero One do a set of paints for the car which are colour matched - the green and the yellow. I had better make a good job of this one! I will continue with the easy bits on the Mini but am really waiting to get the primer so that I can make a really good start on the kit. More later. The Tamiya Mini's are great kits to build, built one myself a few years back. Keep getting tempted to buy another one, but my kit stash is getting too big for now. I have this one and I also have the Revell Monte Carlo 1275s. It will be interesting to compare the two.